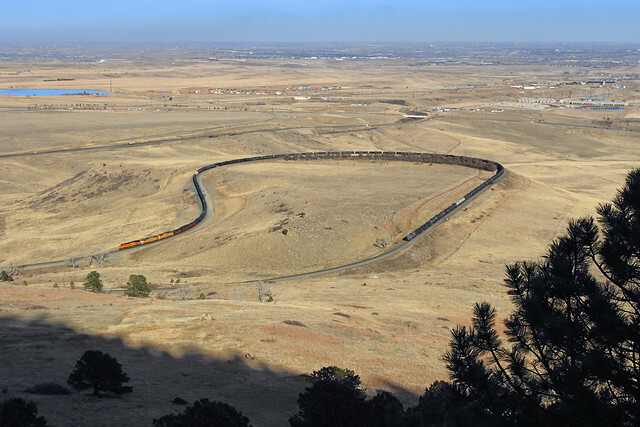 Perhaps no place better symbolizes the challenge faced by railroads heading west from Denver than Big Ten Curve located on the former Denver & Salt Lake Railroad as it climbs from the western suburbs toward the low foothills of the Front Range. Almost as if nature or nature's God knew what was needed for David H. Moffat's railroad to reach the lowest rung of the Rockies, a low mesa juts out of the ramparts just south of Rocky Flats. Today's Photo of the Day, from seasoned veteran photographer Mike Danneman, shows a BNSF manifest freight descending the Big Ten Curve towards Denver using BNSF's trackage rights over the Union Pacific's Moffat Route. Mr. Danneman managed to capture this photo only earlier this week with a couple of warm days that afforded him and his associate Rich Farewell unusual mid-winter access to a hiking trail overlooking Big Ten. It is likely this same trail that afforded Ralph Parsons almost the identical exposure for Robert A. LaMassena's signature work, Colorado's Mountain Railroads. Perhaps the most difficult location was the transition from the western end of the prairie to the eastern foot of the Rocky Mountains. 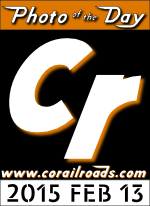 This was accomplished by wrapping the track around a small mesa to form a bent hairpin curve. Six miles of track lay between two points only 1 1/2 miles apart, on the ground, but displaced vertically 600 feet.